AquAid has recently added a new product to our water dispensing range. It is the ELIMINATA® Water Dispenser Saver. This unique plug automatically saves energy used by water coolers, water boilers and combination cooler/boilers. Power is disconnected at night, when the dispenser is not going to be used, and reconnected each morning, ready for use again. Plug-in water coolers, water boilers and combo cooler-boilers are often left on all of the time and waste energy keeping the water hot or cold at times when no-one is going to use them. A typical water boiler can waste up to £48 per year like this. The ELIMINATA® Dispenser Saver has a sensitive light detector and automatically disconnects power when it is dark and turns it back on when it gets light again. If the ELIMINATA® Water Dispenser Saver is set to control a water boiler, the boiler is turned off all night. If a water cooler is being controlled, power is briefly reconnected every two hours so that the coolers’ sanitisation features can operate. An ELIMINATA® Water Dispenser Saver used with a typical water boiler will save £240 over 5 years and eliminate around 1000Kg of CO2. It has a range of features which deliver more convenience and savings. One example of this is that it can be set so that if a security guard briefly turns the lights on at night, the dispenser isn’t powered on again. 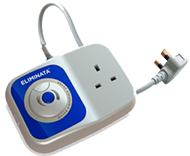 ELIMINATA® products are automatic, ‘plug-in and forget’ energy savers for use with electrical appliances. ELIMINATA® products do not use remote controls or extra cables. Patent pending, smart technology ensures that once the product is installed there is nothing further to do, set-up or maintain in order to enjoy long-term cost savings. Please contact 01223 508109 or e-mail to find out more about this efficient, cost saving product.